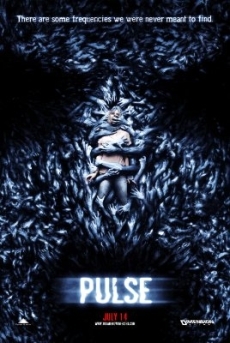 Though finished off at rotten tomatoes with a score of 12%, the marketing department still managed to find some magazine which thought "Pulse" was the scariest film in years and slaps the favourable judgement on the DVD's cover. Whoever does things like that is also not afraid of releasing an unrated version which only contains three additional scenes that have the sole purpose of explaining what happened earlier, so absolutely everybody gets it. The Italian theatrical version, which did not have the cuts of the PG-13 version in the USA, was used as comparison. The movie was initially rated R in the USA, but shortly before theatrical release censored to get a PG-13 rating. Among other things, the suicide from the tower in the middle of the movie is supposed to be missing. The unrated version is in 3 scenes by all in all 134.5 seconds longer than the theatrical cut. After she had the nightmare in the bathtub, Mattie tells the school psychologist that just before her psychology professor almost rand in front of a bus. Mattie and Dexter sit in a diner and explain the movie to the audience. They talk about the reasons for Josh to commit suicide, what he had seen and how the suicides are connected. Mattie plays the believing role, Dexter the doubting, so both audience groups are addressed to. Then a chatoic conspiracy theorist joins the discussion and predicts the end of the world while a goth in the background wants to shut him up by saying that he made them all just crazy and that it's probably only the alcohol in the old man's coffee. In the end, Mattie mentions a construction worker who first had contact to the ghosts and can probably help. After Mattie has found Isabell completely raddled in the apartment, she emphazises again that she imperatively wanted to die, but doesn't dare to take this step.